Home › 1 Lb. 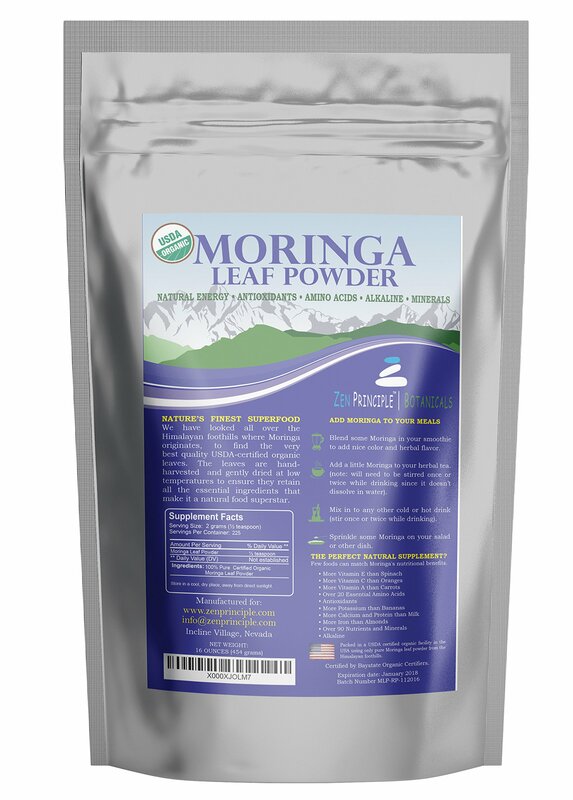 Premium Organic Moringa Oleifera Leaf Powder. 100% Usda Certified. Sun-..
1 Lb. Premium Organic Moringa Oleifera Leaf Powder. 100% Usda Certified. Sun-.. BENEFIT FROM NATURE's FINEST MULTIVITAMIN. Packed with over 90 essential ingredients including 20+ types of amino acids, 40+ antioxidants, 35+ anti-inflammatory compounds, key vitamins, minerals, protein, Omega 3, 6 and 9 oils and phytonutrients. Few foods can match the nutrition provided by Moringa. ENJOY THE GREENEST, FRESHEST RAW LEAVES, NEVER FREEZE-DRIED. Our Moringa Oleifera has been carefully sun- and shade-dried at the ideal low temperature to preserve its precious nutrients and quickly packaged to maintain freshness. Other sellers use industrial machines to freeze dry or heat dry their Moringa. The sun is better! You can see the results in the bright green colors and rich, earthy scent of our Moringa. GET A NATURAL ENERGY BOOST, DETOXIFY YOUR BODY AND MAINTAIN GOOD DIGESTION AND OVERALL HEALTH by adding to your shake, smoothie, salad, or brewed as a tea. GMO and Gluten-free. Vegan. MADE IN THE USA IN AN FDA-REGISTERED AND ORGANIC-CERTIFIED FACILITY. Always ask where your Moringa is made! Other sellers package in countries without the same safeguards found here. Our Moringa is made in small batches, following strict health and safety guidelines. It's then rigorously tested to ensure purity and quality and delivered quickly to maintain peak freshness. WHY USE MORINGA? Benefit from ingredients that offer a natural caffeine-free energy boost and promote overall health and wellness. Add a little moringa powder to your shake or smoothie every day for a color and nutrient boost. Enjoy a Vegetarian Source of Iron. With much more iron than spinach, Moringa is a great natural way to boost iron without meat. Help with Digestion. Taken in small does, Moringa can help maintain healthy digestive tract. Highly Bioavailable. Moringa is 'cell ready' (easily absorbed by the body) ensuring you get more of its goodness. WHY BUY FROM ZEN PRINCIPLE? We Source the Finest Moringa.We only work with the top growers who sustainably harvest the leaves when at peak maturity. We then gently dry it at low temperatures to preserve all key nutrients. We Rigorously Test the Product. Our Moringa is tested by independent labs throughout the process to ensure quality and freshness. We also never add fillers or additives. Resealable Mylar Bag. Our Moringa comes in handy stand-up bags which help preserve it when properly closed and stored in a cool, dry place. 100% Money Back Guarantee. We want you to be happy with our moringa. If you are not for any reason, we'll gladly give you a full refund within 30 days. NOTE: MORINGA OLEIFERA IS A MILD LAXATIVE, START WITH 1 TEASPOON PER DAY TO LET YOUR BODY ADJUST! MORINGA ALSO WILL NOT DISSOLVE IN HOT OR COLD WATER, SO YOU'LL WANT TO STIR YOUR DRINK ONCE OR TWICE WHILE ENJOYING IT. MORINGA TEA HAS A STRONG HERBAL TASTE; SOME PEOPLE MAY PREFER ADDING TO A DRINK OR SHAKE INSTEAD OF A TEA.